We, the Finance Committee, appointed from the General Committee elected at the Parish Meeting to arrange details for the Commemoration in this Parish of the Silver Jubilee of our King and Queen, earnestly appeal to all householders and others, to help to the best of their ability to celebrate May 6th in a manner worthy of our Village. For your information we append a minimum budget made up of various items which the General Committee have arranged for the day. From this it will be seen that we are endeavouring to cater mainly for the enjoyment of the children, so that this day will remain long in their memory. A special feature on this occasion also is to entertain all old inhabitants to a Dinner. We trust that you will subscribe generously to this appeal, as the whole success of the day depends entirely on a voluntary united effort. Donations should be forwarded as soon as possible to the Hon. Treasurer: Mr G.V. Hinds, Beechurst, Goudhurst. Please state if you wish any part of your donation to be earmarked for a particular item. A total of £162 19s 11d was received of which £29 1s 0d was raised by house-to-house collection. The overall expenditure amounted to £140 0s 4d leaving an surplus of £22 19s 7d. At a meeting on May 27th, the committee decided that the surplus money should be used to start a fund for a much needed playing field in Goudhurst. 10.0 Bonfire and Fireworks in “Five Fields”. Dancing etc. Every programme had a number on it to be entered into a draw for a prize of 10 shillings. The winning programme was number 85 purchased by Mr Cornwall of Cranbrook. 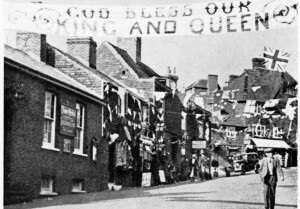 In the weeks leading up to Jubilee Day the streets, houses, shops and business premises in Parish had been decorated with flags and banners. 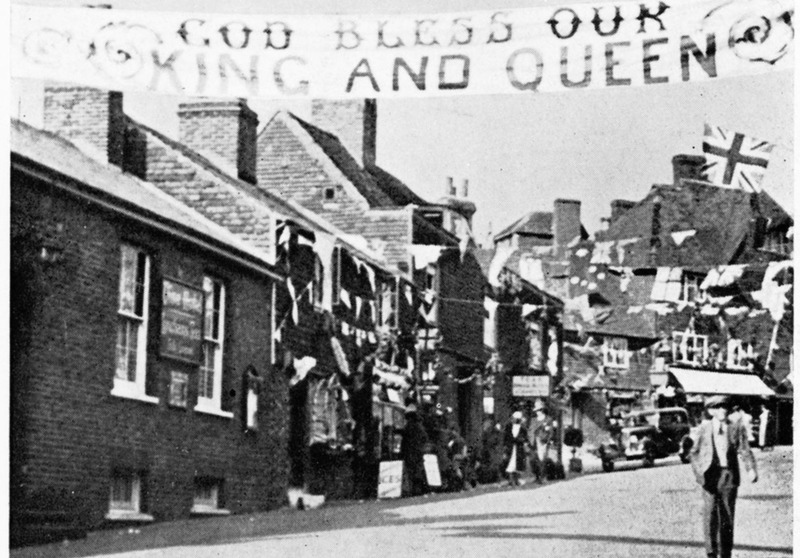 A huge banner reading “GOD BLESS OUR KING AND QUEEN” was hung across the High Street. Members of the various Organisations and Societies, who had by now gathered at the Plain, were ready in their groups to process to the church. The parade, headed by the Goudhurst Band, set off to the church where a service of thanksgiving was conducted by the Vicar, Rev. H.G.South. The church was filled to capacity. A large congregation also attended mass at the Church of the Sacred Heart where Father Dudley gave a brief address. After the service at St Mary’s, the congregation moved outside to see a new flag of St George unfurled on the church tower. The choir led the singing of the National Anthem from the church tower. The parade then moved on to New Road for a tree planting ceremony. J.A.Druce Esq. 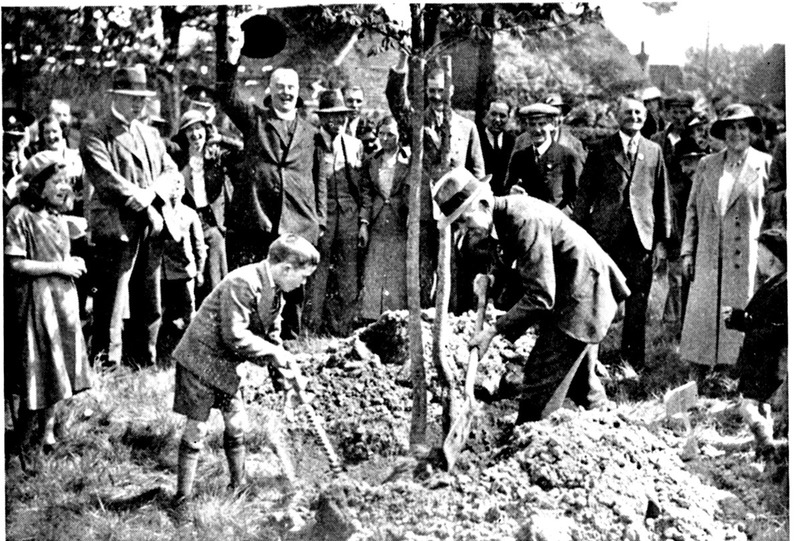 gave a patriotic address before calling on George Osgood, Mary Gartery and Edward Wilson, the youngest children at the National Schools having the same first names as the King, the Queen and the Prince of Wales, to plant 3 commemorative trees. 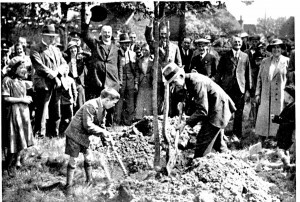 The trees, 2 chestnuts and a copper beech, were provided by the Goudhurst Gardeners’ Society. At midday, 99 old folk of the Parish sat down to dinner in the Village Hall. Those who could not attend were later given a gift of a Jubilee tin of tea. In the afternoon there were sports for the children and adults in the Vicarage Field. At 4o’clock, when their sports had finished, the children, led by their own band, marched from the filed to the Village Hall for their tea. There were 282 children and each was presented with a Jubilee mug. When the children had eaten, tea was provided for the adults. At 6 ‘o’clock some 80 entries for the Carnival Parade formed up at the Plain. A lot of time and hard work had been put into the creation of some of the entries. There were children and adults in fancy dress, and decorated prams, bicycles, cars and lorries. There were so many entries that the judges decided to award extra prizes. 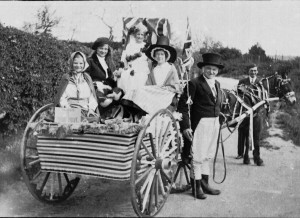 After the judging, the Carnival Procession set off on its tour of the village. When they reached New Road they watched the children dancing round the Maypole. When the procession had returned to the Plain, the prizes were presented by Mrs Druce. 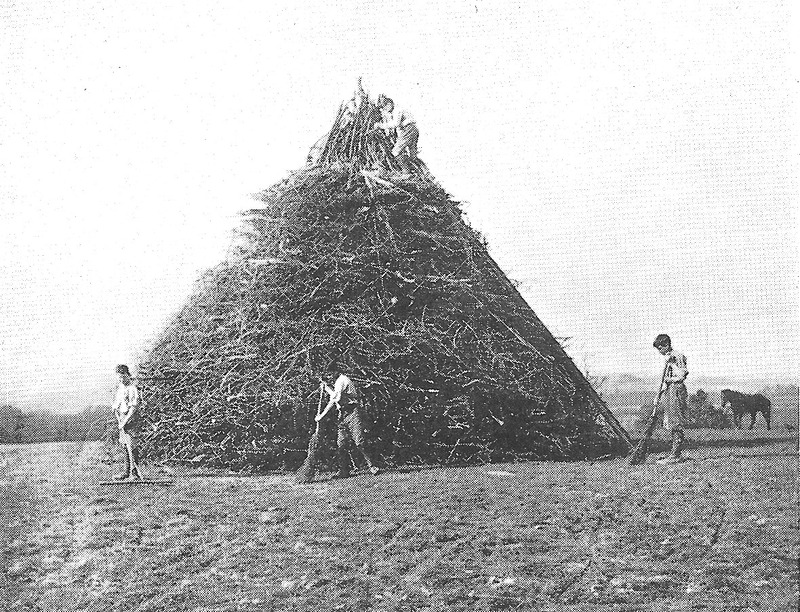 In the few weeks before Jubilee Day, the Scouts had made 200 torchlights ready for the Torchlight Procession and the Rovers had helped to build a huge bonfire at Five Fields. 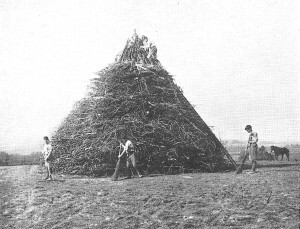 The bonfire measured 45 feet round its base and was 30 feet high. At around 9 ‘o’clock the Torchlight Procession made its way from the Plain to Five Fields. Onlookers waited excitedly until it was time to light the “Goudhurst Beacon”, one of 2000 beacons around the United Kingdom. Flames rose high into the night sky to the cheers of the crowd and soon after the firework display began. The celebrations around the bonfire were brought to a close at about 10.45pm when everyone joined in the singing of Abide With Me and the National Anthem. For those who still had the energy, celebrations continued in the Village Hall where there was dancing to the music of the Byng Boys‘ Band. A touching tale to end with: when Mr W.H. Wallis returned home to Triggs Farm at around 11.30pm, he was just in time for the birth of a foal. She was born just before midnight and was aptly named “Jubilee”. 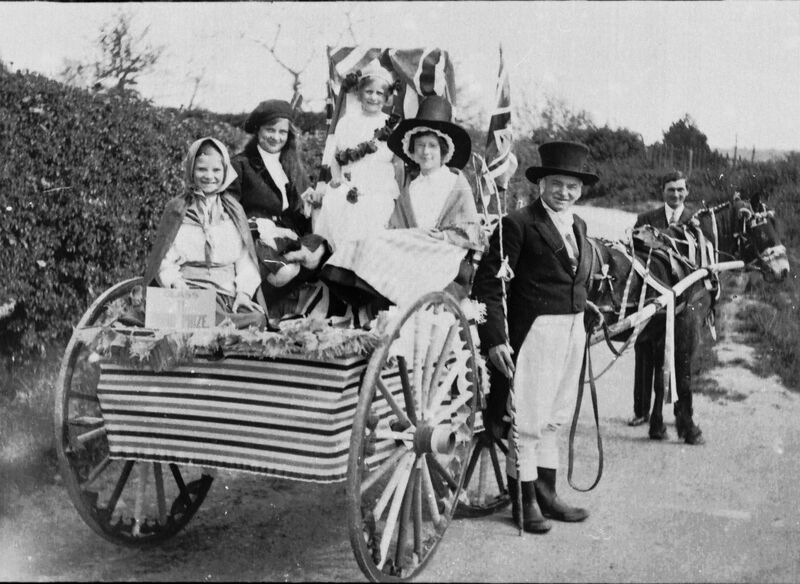 A few miles along the road at Horden, celebrations followed much the same pattern as in Goudhurst Village. There were sports for the boys and the climax of the day was the lighting of a huge bonfire by Mrs Fegan, followed by a firework display.